CORNELIA GUEST breaks new ground in vegan cooking with Cornelia Guest's Simple Pleasures, and you'll find having your friends over is a breeze with her tips on how to take the stress out of entertaining. Cornelia's recipes raise the bar for vegan cooking, with food so delicious that your family and friends will not even miss the meat. The daughter of fashion icon C. Z. Guest and polo champion Winston Guest, Cornelia learned from the best -- entertaining is in her blood, and now she's passing her secrets on to you. Cornelia Guest's Simple Pleasures, a book as practical as it is beautiful, will show you how to incorporate affordable, cruelty-free eating into your daily life and to serve that luscious, wholesome food to friends. Organized by season, each part begins with a terrific meal -- a light spring lunch of chilled asparagus soup and quinoa salad; an alfresco summer dinner of veggie carpaccio and stuffed squash blossoms; a fall breakfast buffet of pecan waffles, faux buttermilk pancakes, and raspberry muffins; and a cozy winter's dinner of shepherd's pie with a chocolate tart for dessert. Each seasonal section contains recipes for beverages, soups, salads, pastas, side dishes, main courses, and an abundance of desserts that everyone will love. Special sections feature recipes for grains, greens, and beans. In "Notes from My Friends," which appear throughout the opening chapters, chefs, doctors, Cornelia's favorite veterinarian, and other health and food experts have contributed tips, advice, and eye-opening information. Dismissing fussy food and pretention, Cornelia believes the key to entertaining well is simplicity. Cornelia Guest's Simple Pleasures is filled with advice on how to set a lively and original table, bring nature inside, and stay calm in the face of entertaining disasters. She shows how a little thought and effort make it a snap to create both a relaxed, warm atmosphere and fabulous food free of animal products that will please your friends and let you enjoy your own party. 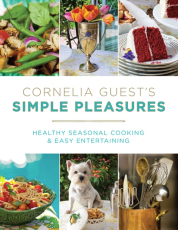 Richly illustrated with photographs of Templeton, Cornelia's legendary home, Cornelia Guest's Simple Pleasures captures the feeling of a well-lived life. Cheerful, colorful, and accessible, Cornelia Guest's Simple Pleasures will give you all you need to know to eat in the most nutritious way possible and to serve it up with great style.